The leaves, twigs and cones of the Cupressus sempervirens are steam distilled to form the essential oil. 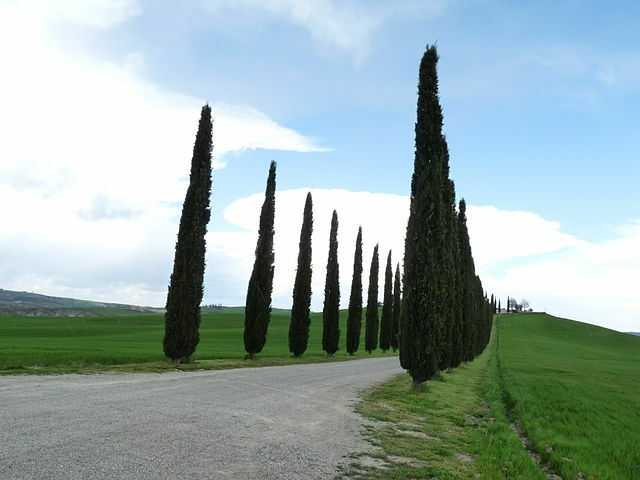 Cypress is found primarily along the Mediterranean coast and is often depicted in landscapes by Van Gogh and Cezanne who painted through out the south of France. Some of its properties are antiseptic, antispasmodic, deodorant, diuretic and tonic. Cypress is good for any excess of fluids, be it edema, cellulitis, heavy bleeding, excessive perspiration or a runny nose from a cold. With inhalations or burning it in an aroma lamp, coughs, mucus and discharges are relieved. Massaging with cypress essential oil in a carrier oil can help enormously with fluid retention and breaking down cellulite. Massaging around the abdomen or using cypress in a sitz bath can help relieve menstrual cramping and heavy menstrual bleeding . It regulates the hormones so most menopausal symptoms can be addressed and hot flashes greatly reduced. It is also good for varicose veins and weak connective tissue. Because it slows the flow of excessive bleeding, it is a great aid for hemorrhoids and bleeding gums. As an antiperspirant, cypress works wonders on smelly, sweaty feet and can soothe swollen tired tootsies. By soaking in a foot bath with a few drops of cypress added to the water, tension and aches melt away. Feet return to their normal size and feel wonderful. On an emotional level, cypress eases grief and distress. It calms an overburdened nervous system and helps with stress and tension. Because it grounds frenetic emotions, cypress allows for clarity of thought and peace of mind. It is a great aid in these days of too much to do with not enough time to do it in. 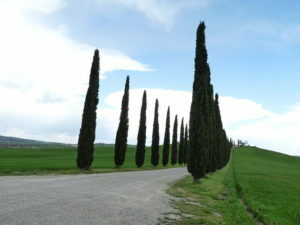 Cypress seems to slow down the clock, allow focus and make the space to get things done. Being a yang oil, with strong powerful energy, we are able to pull that assertive go-get-it nature in and work efficiently. So next time you have a zillion items on your list of things to do, sit quietly at your desk, burn a little cypress in your aroma lamp, and watch how easily it all gets done. To hear a meditation on cypress, “click here”:http://www.suzannebovenizer.com/meditations/releasing-negativity-cypress-audio-meditation.